Previous PostSGD INR: Post the Election EuphoriaNext PostRBI Cuts Benchmark Rates – Now What? Logically it should unless the Fed decides not to increase rates this year. What is your outlook on the SGD-INR exchange rate for the next two weeks. It is surprising that the rupee is seen appreciating even after the RBI rate cut. Any major events you foresee would significantly impact the exchange? It is indeed surprising that INR strengthened after the rate cut announcement but then again markets are strange and they might be closing open positions before the long holiday this weekend. I don’t see much movement in next 2 weeks unless the NFP numbers come very strong tonight. Indian manufacturing index was at few months low yesterday so I am not really convinced that INR is fundamentally strong. I took the risk and waited. But the rates are going down now.. What is the point where we can expect it to stabilize? Also what was the decision of MAS on the interest rates? Rates should stabilise in a weeks time. The Fed decided not to increase rates. MAS has not done anything. However there is a RBI meeting on 29th Sep where a rate cut is widely expected. If RBI cuts rate then rupee could gain for 2-3 days then fall. However I would personally think that a rate cut by India should cause rupee to slide to 67 against the USD. But then again markets don’t always follow logic and fundamentals take a while to kick in. Aditya, you were spot on with the 14th Sept week.. The rate has gone up and now hovering around 47.45. Is this the right time to convert? Hi DevDeep, converting over next 2 days should be beneficial. The next key event is fed raising interest rates or not on 16/17 Sep. If the interest rate rises there would be extreme volatility in forex market both SGD and INR would fall against the USD, but if there is no rate rise then sgd should strengthen more than INR. So if you want to take some risk wait for 2 more days otherwise can convert now also. Hi Aditya, I would like your suggestion on investment plan. I am holding SGD abt 70K. is it good idea to send to NRE account and FD the amount or are there any good investments in SG where we get considerable return. (I heard the FD rates are down to 7.9% now in NRE). I am planning to transfer 50k SGD to INR at good exchange rate . could you please advice whether i should wait few more weeks/months to get good rate or i should send it immediately at current rate which is 47.12. I would suggest transferring 25k now and 25k in the week of 14th Sep.
65.25 Already.. Now have to wait and watch.. Yes. I have maintained all along that the rupee is grossly overvalued and maybe RBI needed a reality check that it’s ok to let Currency depreciate and not keep it strong by open market interventions. Finally it happened with China going ahead of the game. With CNY devaluation, what could be the impacts on SGD/INR rate. For next 1 yr just keep transferring SGD to INR as soon as your salary is credited and book NRE FDs. Its the simplest as well as the smartest thing to do. Dont buy property in India. Indian property is going to crash or stagnate. Invest in FDs, MFs and stocks. The sgd/inr rate has gone down to 45.68. Could you please share your opinion if its expected to go up to around 47 in next 2 or 3 weeks. Hi Amay, I don’t see it moving up to 47 in next 2-3 weeks. The action on sgd front will happen after 12th Sep, speculated date for the upcoming elections. INR wont fall as much as other currencies reason being commodity prices are falling. As India is an importer of commodities, INR is going to benefit from the commodities slump. As USD rises commodities like Oil etc fall even more, which is net positive for INR. As far as Singapore is considered. Its biggest trading partners are in big trouble, both China and Malaysia. I see no end to Singapore’s woes. Just read SBR.com.sg. So much of negativity on every economic front. Its just a matter of time before SGD falls. Thanks Aditya, the info was helpful. I think USD has very tactfully placed its currency in the major traded product, major component is OIL. Therefore no country can dump the USD without bringing down its own economy. Forex reserves should cover the countries Imports, repayment of debts plus any contingencies. India has a negative BOT so it should always keep more reserve. Even Singapore being such a small Country beats India in terms of Trade Exports. India is just not Exporting enough and Self consumption is huge. China too went from 100 Bn in reserves in 1996 to 4 Trn in reserves in 2015, Is there any hope for India? Yesterday Chinese market plunged more than 8% pulling the USD down along with its currency. My question is Indian Rupee depreciated more than the USD to give SGD a quick jump in the last two day, why did this happen? How deeply is India linked to USD. Because the charts show steady increase in USD against INR over the years. 2. Earnings of US companies have started to hurt as the dollar has gained strength. 3. If interest rates rise the cost of servicing a loan – be it house or car becomes expensive and can result in defaults if the global economy falters. On the other hand Singapore Dollar is eclipsed by a potential MAS easing in Sep.
RBI in India is trying to remove volatility from the forex market and have a predictable USD INR rate. My personal view is that RBI wants to see Rupee decline in a controlled manner and build sufficient reserves to fight any market volatility. For a country like India 350 billion in reserves is not much and pales in comparison of 3.73 Trillion of China. Just imagine if a rout like Chinese Stock market sinking happened in India would RBI have enough money to prevent forex volatility due to FII selling? Now to answer how much is INR linked to USD – quite a bit. INR is a partially convertible currency and USD is still the preferred currency of trade. 2 of the India’s biggest imports – Oil and Gold are traded and settled in USD. Therefore if and when Fed would raise the interest rate INR would weaken against USD. The key thing is the figure called Exports as a share of GDP. In case of India the figure is only 25% and in case of Singapore it is 190%! So you see how important exports is for Singapore compared to India. So Exchange rate is a very very important thing for Singapore and not so much for India. With China slowing down, it has a big impact on Singapore. Rest of the world growth too is weak. In such circumstances, India is much better placed than Singapore. 1. Singapore’s has practically no natural resources so the GDP is bound to be from exports – be it services or manufactured goods. 3. India’s exports have risen over a period of last 3 decades as the currency has weakened. comprehensive data for all countries can be seen on worldbank website. A key differentiating factor here is India has a deficit economy and Singapore has a Surplus economy. What does that mean? Indian govt spends more than what it earns and relies on capital receipts and borrowings to make up for the shortfall. So the question still remains where will India get the money to spend on infrastructure and defence? Using the same logic countries like Australia (20% export to GDP ratio) and Japan (15% of export to GDP) should not be trying to weaken there currency to improve exports. There share as a percentage of GDP is even smaller than that of India. Over 1 month period, SGD is the 2nd worst performer in Asia and INR has been the 3 best performer. Inflation and growth outlook for Singapore are such that SGD has to fall a lot. But then MAS may keep the SGD elevated so that SIBOR doesnt rise too much. SIBOR and SGD are inversely co-related. Canadian dollar is now at its 6 year low. Basic theme is all commodity exporter currency are getting worse hit due to falling commodity prices. Next in line are finished product exporters like SGD, CNY, Korean Won, JPY etc are getting hit due to low global growth. Best performers are internal consumption stories like USD, GBP and INR. And where will India get the money to import oil, spend on defence and build infrastructure? Also add to that the Iran nuclear deal, which has put a cap on oil prices. Oil is now unlikely to cross the 70 mark for a long long time, giving strong support to the Rupee. Hi Aditya, Thanks for your insights. Please share your vierws on SGD-INR by July end. At the moment, it is around 46.50. Hi. Two very interesting developments have happened over past 24 hrs. The US retail sales grossly missed the estimates and Singapore’s GDP came short of expectations. A miss in retail sales means that US interest rates rise might get delayed and missed GDP could result in MAS easing. The 2 news items have a equal and opposite impact on SGD and has resulted in USD SGD remaining flat. However rupee moved up against the USD due to less than forecasted US retail sales which impacted the SGD INR. I am expecting INR to weaken again after the knee jerk appreciation. Wait and watch for 2 days for clearer trend to emerge. Hi Aditya, good to see your analysis/forecast on SGD-INR exchange rates and it helps many people like me. Thank you. I was waiting for SGD to hit 49-50 rupees for more than an 1.5 years where SGD was around 48+. Now i realised that should not have waited for it rather i could have converted them to INR and opened a fixed deposit in India through which i could have received the returns equivalent to the excahnge rate @50 rupees. So i have transferred 25K SGD during mid May at an exchange rate of 48 rupees… Later again the rate fallen down. I wanted to transfer 75K+ SGD at a good exchange rate(not less than 48). In view of my long wait and lumpsum amount to transfer, do you advice me to wait for few more months and do you foresee SGD-INR rate hits high(around 50) again in near future like what happend in 2013? Please advice if it is worth to wait as i waited for this long and i dont want to loose when excahnge rate is expected to increase. I have always advocated transferring money in small chunks to average out the Exchange Rate as it is impossible to catch the top and the bottom of the market. From a medium term perspective I do not see the Rupee crossing the 48 mark in the next 2-3 weeks and doing the math every month you wait the opportunity cost is roughly 30-25 paisa in interest. So If I were to take the current exchange rate of around 47 in 3 months time money converted now would grow to roughly 48. I was advocating people to transfer money at any rate over 47.75 just a few months back and would recommend you to make a part transfer at 47. The Rupee has been uncharacteristically resilient and I expect it to resume the downward slide against the USD around last week of August. If you want to wait and take a chance I would recommend putting money in DBS Multiplier account or OCBC 360 account where you could earn an interest higher than the savings account. The sgd to inr rate has fallen below 47. Could you please provide your inputs if you think that it would rise in the near future. Yes, the rate would rise again and I expect it to fluctuate between 47 and 48, however 10-15 paisa either side of the above limit is also possible. What’s happening with the market. Can we expect stable SGD/INR?? Before SG national day. Does it going to (SG50) creates any mark with SGD/INR exchange rate?? The plunging euro: Good or bad for Singapore?? It depends on what do you mean by stable SGD INR. The currencies are expected to be volatile as the Greece saga unfolds. I don’t think there is any mark that MAS or any other body would be creating with SG50. A systemic devaluation of currencies across the globe would cause trouble for export oriented countries be it Singapore or India. They would not be competitive if they don’t devalue the currencies simultaneously. 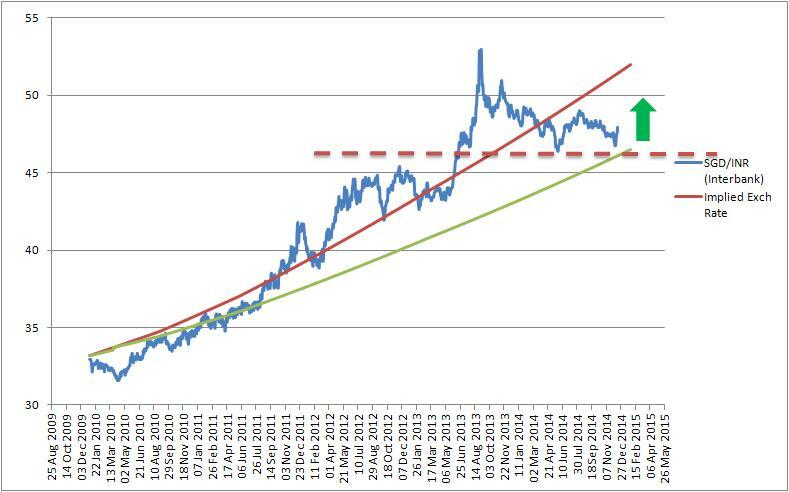 I see sgd is gradually appreciating, will this trend continue, is it advisable to wait or transfer now. I would be sending closely 50K SGD. My recommendation is to transfer in chunks. It’s impossible to catch the highest price. Any rate above 47.75 is a good rate. If you are taking a loan then I would recommend waiting. I am not very hopeful about the monsoon and the Rupee has to weaken sooner or later. However any rate above 47.75 is a good rate to convert. I am just trying out interesting stuffs(getting my hands dirty).8900 is not much in terms of money but in terms of interest it is a significant amount. to earn 200$ in interest in Singapore i think you will have to keep 40k in the account for 6 months. Suddenly 40k is a lot of money (for me at least). Moreover whether SGD will rise or fall is 50% based on calculations and 50% on other environmental factors. History shows us that fall is always much fast than rise. So if SGD rises we are looking at 2% cap but if it falls, god knows where will it stop (from 49 to 45 in just one month). So am thinking will wait one month and if i don’t see any significant movement will go ahead with the transaction. Taking a loan and converting only makes sense when the SGD is imminent to fall and you want to hedge the value of your future savings, in INR terms. Also it makes more sense if you want to take a loan for 1 year worth of savings and then the 8.75% Indian rates quarterly compounding gives close to 9.2% or something. At the current exchange rate and the small amount that your are talking about and also just 6 months duration, is really not worth the hassle. Rs 8900 is less than $200. Thanks. That was the fear in my mind too.1,5% appreciation is very much possible in 6 months but the bank has offered me 5k at 0 interest and 125$ OTP charge. Which has confused me if i should avail this facility as i will have the liberty to keep the money for 2 months easily while waiting for a rate rise as the interest i can recover in 4 months in India. So the next two months is the decider. Whats your take on the next two months behavior of the rate. Is it likely that it will hover around the 46 range or will it go 47-48 or 44-45 range. I think your effective rate is 5.4% pa for the loan (I am assuming you have to pay monthly minimum instalments). The direction would be set by MAS policy meeting due for sometime in April. If I am reading the markets correctly market has already priced in no further easing from MAS and that’s what caused USD SGD to fall. If MAS does nothing then usdsgd should move to sub 1.35 levels which would be sufficient to push SGDINR to 46.5-47. Rupee should weaken slowly to 63+ and that should bring SGDINR closer to 47. So equivalent SGD = 46.39. So was asking is there a possibility that the rate can improve from 46 now to 47 in next one month or so. So that i can take advantage of the extra 1 rupee plus the interest. The SGD INR would have to move to 46.7 for you to get 46.40 while transferring through banks. That’s roughly a 1.5% appreciation from the current rate and very likely. Though I think that you might get a better offer on the loan terms from citibank. Sometime back they had offered me 2.40% reducing balance with zero processing fee. Interest Earned – 4,460 Rs. So the only way you would stand to gain with this transaction is if SGD INR falls below 45.50 in 6 months time. Rest I will let you decide. I am getting a loan from bank @ 2.5% for 6 months. Is is a good deal if i take it and convert it to INR @ 45.75 current rate and invest @ 4% for 6 months FD while paying them off after 6 months from my earnings here? While it looks like a profitable transaction the Ex-rate exposure might mitigate the profit. Kindly suggest should i go on with this transaction or should i wait because the bank will take the 2.5% upfront. It really depends on this Yemen conflict, I have said before that when there is heightened risk off scenario INR will fall or after that INR will rise. Make use of this opportunity to convert your SGD to INR, if your holding a big chunk. i see sgd is gradually appreciating ,will this trend continue?>,is it advisable to wait or transfer now. Thanks Aditya & Nitin today SGDINR reached 46 Can you guys explain reason for this big difference in one day and overall week its increasing. Hi Ajeet, do check out my latest post. It was good to see that the chief economic advisor shares the same view as me and has recommended that we should weaken rupee whenever possible. Sorry there is a typo in my previous comment, the end of year target for INR is 64.5 as per this Barclay’s analyst, and not 63.5. For SGD the target is 1.44-1.47 according to UOB. Hi Ajeet, I am not an analyst, my view based on reading other analyst reports. I cannot predict in the near term, but based on the reports I read, SGD is expected depreciate to 1.44 by the end of the year and INR is predicted to reach 63.5 by the end of the year. So you can see there is much higher downside potential for the SGD. Add to that INR interest rates are so high that if you convert now and put it NRE FD or savings account, you earn even better returns. Every month that you delay in converting you lose about 35 paise due to interest income lost. Hi Aditya both of your and Nitin comments are conflicting. what you suggest really do we need to wait for more 15 to 20 days to improve SGD INR. Yes the comments are conflicting because I believe that INR is overvalued and SGD has been oversold. I do expect SGDINR to move up in next 3 weeks time to atleast 46 level. In the 3 month period I still maintain it to move up to 47-48. However for people who have loans in India they should not wait for Exchange rate to improve at clear their debt first. What would be SGD to INR rate in April? I don’t think SGDINR would go below 45 and there is every likelihood of it touching 46.5 in april. The deciding factors would the both RBI and MAS meetings. Every Central bank manages the volatility in the Forex markets through open market operations or policy statements. ECB made statements around overvalued Euro, Australian Central Bank got the AUD to fall by calling it overvalued, Japan similarly called the Yen overvalued and resulted in its decline. Singapore dollar is a pegged currency and it is pegged to a basket of trade weighted currencies. MAS intervenes in the currency markets on a daily basis to maintain this peg, instead of letting market forces determine the price of the currency. By selling reserves, MAS was buying local currency to reduce liquidity and inturn increase the demand for the currency local. Basically pegged currencies are extremely dangerous. Read more about how George Soros basically made the ECB bankrupt by breaking the pound’s peg to the German Mark. India’s RBI intervenes in the currency markets only to reduce volatility when there is sudden appreciation/depreciation, but the central bank doesn’t decide the direction or the level of the exchange rate, we dont even have the kind of reserves to do it, even if we wanted to. Just curious to understand. Where this money is spent ? Isn’t it a normal phenomena used by central banks to switch between local currency and foreign currency reserves? Singapore is spending billions of reserves to prop up its currency, a report by DBS revealed. According to DBS, Singapore’s reserves have fallen by US$34 billion since July, a trade-off of keeping the SGD on its appreciation path. “In six short months, reserves have fallen by the equvialent of 11% of a full year’s GDP. Little wonder the central bank eased back on the appreciation path in late-January, Further easing will be necessary if reserves don’t stop falling,” the report stated. Now with Brent falling again below $55, I only see INR only appreciating. Anybody who has a huge amount in SGD and want to convert to INR, do it now! SGDINR has moved from 33 to 53, the fall to 45 is still not a lot, it could easily go to 40, once USD stabilizes and FIIs start investing in India. Indian markets may correct 10-20 per cent this year as implementation of government’s reforms programme has been disappointing so far, saidMarc Faber, global investor and publisher of the widely-read Gloom, Boom & Doom Report. Eagerly awaiting for better conversion rate to transfer money to india. If there is no outstanding loan in india, can we still wait ? Recently I came across this post and found very useful. Just three months ago, when USD2INR was around 63, SGD2INR also came up to 49+. But now also USD2INR is around 63, but SGD2INR dropped to 44+. If INR is getting stronger, then both USD2INR & SGD2INR conversion rate should go down right? Why only SGD2INR is going down? INR has been amazingly steady so far. But if US hikes rates, SG will probably hike too, that could be a potential trigger for SGDINR to move upwards. Brent at below $60 is also giving lot of comfort for the INR. day by day SGDINR going down today reached to 45.20 i dont know man will it go up soon or not. Dollar strength or Rupee weakness it’s just two sides of the same coin 🙂 . The crux remains that the valuations on Indian markets are 20-22 times forward earnings which is higher than other regional markets and earnings need to improve for the valuations to be justified and for earnings to improve the pricing has to be competitive. Repo rate changed to 7.50 whats impact on home loan and also any chances that SGDINR rate improve. Thank you for your inputs. I want to transfer a bulk amount to India for my home loans. Do you feel doing it now is the right time or wait for some more time. For transferring money towards a home loan you should transfer soon. The benefit of exchange rate improving compared to Interest outlay that you have is not favorable. I read news on rumors of RBI going for a rate cut soon and also MAS to further ease monetary policy in next month. If this turns out to be true, then it looks like SGD is heading for weakening and INR towards strengthening. Theoretically everytime a central bank cuts rates it should result in the currency weakening – Australia, New Zealand are good examples. In case of India one would argue that cutting rates would help with lower interest outlay and that should result in rupee strength but with service tax hike which will add to inflation should prevent RBI from drastic rate cuts. Even if there is a rate cut the RBI would not want rupee to appreciate specially when China is devaluing currency and with a strong rupee the government’s “Make in India” agenda would not be attractive to foreign companies. Speculators might want to create a artificial panic by buying rupee but I would like people to remember what happened to rupee when it went to 58 as BJP formed government only to slide back to 62-63. With recent rainfall and crop destruction I see headwinds for rupee. On the back of what I said earlier with a rate cut rupee weakened and closed down roughly 1/2 percent. The traders did push the sensex up and then it fell roughly 600 points from high to close in the negative territory. If I am reading this correctly the RBI governor wants a weaker rupee and a out of meeting rate cut might be an indication of that. I agree, this budget was kind of disappointing, but still its not going to change the dynamics of the rupee so much. Major factor is going to be, how FIIs who come out on Monday are going to play the markets. Saturday, Domestics investors kind of gave a thumbs up to the market, considering how it closed, although most of them hadn’t read the fine print, yet. If FIIs continue to buy and markets go up and oil doesnt suddenly shoot up, Rupee is going to remain strong. As expected there was nothing extraordinary in the budget. No big bang reforms or policy changes. Not even removal of duty on gold which was much anticipated. I maintain that with budget behind us the rupee would creep to 65 against the USD which would decide the course of SGD INR – I see it moving to 46-47 in next 4-6 weeks. One sign to watch would be advance tax collections for Q4. INR seems have to suddenly shot up just now and SGD has fallen below 1.36 making the SGD/INR precariously perched on the 45 mark. Infact Ajit’s DBS rate of 45.15 looks too good now. My bet, the budget is going to be a super hit. I expect some major break through announcements and markets should shoot up. I thought that it will increase by Feb end, but still it is decreasing more and more 45.15 DBS rate. Still you think Indian budget will make it around 47 or any chances to that it will go below 45.
thank you fr your reply. is it possible for sgd to come to 49/50 in 2015? pls suggest. With the current rate of 45.5-46 and 8-9% rate, even if you convert today the money would grow to equivalent of 49-50 by the year end. I need to convert sgd to inr to my NRE. Im waiting for SGD to come to 49. Is this possible by end of March? Pls suggest. 49 by end of march is unlikely unless the budget is a complete disappointment which I dont think the government will allow to happen given the recent loss in the Delhi polls. I have a home loan in India with 10.25 percent, which I intend to repay in full through my sing dollar saving. As can be seen that sing dollar is now in the range of 45.21 and 45.50. Do you see a further rise in the rate in the near future. Also, do you see that Indian budget would have an impact on the rate. Could you please advise. I would suggest that you slowly transfer money to India, say in chunks of 5k to average out the rate instead of waiting for rate to go up substantially. Looking at at from a pure cost of money the SGD INR would have to move up by 40p every month for you to wait for the exchange rate to rise instead of paying off the loan. I do expect the Rupee to weaken post budget and ease towards 63 mark against the USD and move up to 46 against the SGD by end of Feb. If RBI cuts rates further after budget, there will be more FII flows into Indian debt and equities and INR should appreciate despite the popular belief that currency falls when rates are cut. This happened during the last cut. Indian equity markets will also gain if there is a rate cut. Thanks for the response.. So you expect INR – SGD to come around 47-48 in near future ? Yes, after the budget and leading upto monsoon. However do factor that if you converted now around 46 and put in fd for 4 months you would still earn roughly 1.25rs in interest so it would be a neutral trade off. RBA(Reserve Bank of Australia) just cut rates by 25bps and now the AUD has fallen to almost parity with the SGD. NZD has fallen even below that. Suddenly SGD is looking very overvalued against some of its peers. Expect further easing by MAS and SGD should now fall towards 1.37-1.40 levels to the USD, its just a matter of time. So how overvalued is INR against all the currencies? Will SGD to INR fall even more after budget like 42 or even down ? No I dont think it will go to 42. I am waiting for the RBI governors announcement today and would not be surprised if he cuts rate by another 25 basis points to send a strong signal that currency is overvalued. I think the sgd to inr rate has slowly started picking up after the immediate effects of MAS policy change. As mentioned earlier by you, do you think if Rate should be around 45.5 to 47. Boss with Modi reforms n make in india moto of the govt what are the chances of rupee. Falling rupee after budget . Don’t u think rupee will fall more. Theoretically I agree with what you are saying. A relatively week currency or superior product is needed for the make in India campaign to be successful but market forces are almost always irrational. I think the rupee is fairly valued at 66 to a USD and that’s what I would expect it to be for robust growth in economy. I am planning to buy property in India end of Feb or start of March and i have to remit lumsum amount SGD to INR what you suggest that time will rate will be better. is any chances that it will come to 48 again. I think with the market focussed heavily on Indian budget i don’t think 48 is possible in 4 weeks time unless something drastic happens in the global market. Ofcourse if the budget is disappointing then rupee might go all the way to 50. Central banks are going in for a currency war. First the swiss bank and now MAS. I think the market had already priced the change in policy in the past few weeks and I don’t expect much weakness from here on. The rate should stay around 45.5 to 47 for next 3-4 weeks. Thanks, Aditya for your quick reply. Thanks for your posts. They are indeed very useful and informative. The SGD TO INR rate has fallen drastically. Do you see it going up in the coming weeks. Thanks for the encouraging words. I believe that Rupee would remain strong until budget due to expectations of some strong measures and after that it should weaken towards 65 to USD. The driver for SGD INR rate this time around should be INR’s movement against USD. @Aditya – would be keen to hear more on your findings/recommendation. @Deepak – converting from SGD-INR now would mean losing money. Plus, don’t think the RBI interest rates will be revised by a huge margin, won’t you still lose money compared to waiting for SGD to rise up against Rupee? SGD is down by $2 in a week and interest rates shall be revised by RBI soon. Thinking if its the right time to convert ? If you are going to invest in a fd then its always a right time to convert, however if you are converting due to recent fall and are fearful of further depreciation in SGD INR then I would say think again. Thanks Aditya, always helpful reading up your blog posts, And thanks Nitin – for sharing those articles. And agreed, I have been pondering over the same thought for some time now – if there are other better investment options available. But nothing seems as attractive as a guaranteed 8-9% return with minimal or no risk. Do you two gentlemen suggest any other options (mutual funds / stocks etc)? I am shortlisting a few corporate bonds/debentures which would give a much better return than a FD but ofcourse taxation would have to be taken in consideration. Next year too the outlook seems to be positive according to them. Dont forget to deduct 2% conversion charges – 1% to convert to INR and 1% back to SGD. Though as I have always said converting to INR and keeping in NRE account is always a safe bet. Thanks Aditya, Fair points. I think, just like that article mentioned, this year India has been treated just like other emerging markets and there have been outflows from Emerging Market/BRIC ETFs of which India has been part of.Also there have been FII outflows from debt funds as they have made tons money due to yields on the govt bonds falling. I really hope next year, India will be differentiated out, especially if Russia becomes stable and oil hovers around this 60 mark, emerging markets as whole wont be under so much pressure. The key however though is, India cutting rates and US raising rates. This would definitely put pressure on the Rupee as there will be more outflows from debt funds as the yield differential will reduce. That is something to watch out for. So I agree with you, there are headwinds for the Rupee. If there are aggressive rate hikes in the US and aggressive rates cuts in India, the Rupee is screwed, especially if growth in India doesnt pickup and we have very bad deflation. Thanks for sharing the Morgan Stanley recommendation. The key here would be how both currencies perform against the USD. The US GDP growth is almost similar to that of US and even with oil falling the Rupee has weakened all the way to 63+. Just imagine what happens once the Russia crisis is resolved and oil starts to move back up. Even though it is being potrayed as middle east trying to drive out US shale producers my take is that the falling oil price is a proxy war on Russia to cripple it financially and make it comply to US demands. Sorry not aware of any places that will give you cheap long term loans, the only thing you could use would be a 6 month loan that some card companies offer for 2-3%. On a related note, Aditya, do you know any ways of getting cheap SGD loans/leverage to do a carry trade of investing in NRE FDs at 8.75% interest for 5 years? I looked at personal loans, but the interest rates are high(~7-8%) and you can only borrow 4 times monthly income. Well, I think only in case of sudden risk-off scenario in the world, will the Rupee fall vs the Singapore dollar, like it happened for couple of days around Dec 17th. But return to normalcy is Rupee appreciating and SGD depreciating as is evident now.